Bike seats are unique and different just as riders are, and what works for someone might not necessarily work for you. 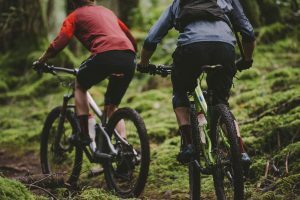 Mountain bikes require the rider to crouch, perch, or ride in various positions. Thus it’s important to go for a mountain bike saddle if you plan to ride on a hilly terrain. Regardless of whether you will be riding for fun in a race or exhibition, you need a good bicycle saddle that will absorb the shock before it gets to you. A mountain bike saddle is a significant component that affects the bicycle performance, and is the fulcrum of energy transfer. When choosing the best mountain bike saddle, make sure it is good quality and fits your riding style. Here is our review for the best mountain bike saddles. A well-known manufacturer for Quality Mountain bike parts WTB’s (Wilderness Trail Bikes) artistry can be seen all over the WTB Rocket Race 150 Saddle. The Rocket Race 150 is a mid-range priced saddle that is aimed at giving the user a smooth, comfortable ride. 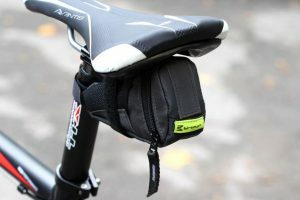 Due to its limited surface area, the saddle is meant for riders who don’t move a lot while cycling. The bike saddle is of average weight, weighing in at 12 ounces. The width dimensions are 15 centimeters, and mid-length is 26.5 centimeters. The Rocket Race is crafted out of microfiber, and the shell is tuned for maximum flex. The padding is somewhat average compared to others in the market, and it also features chromoly rails for extra strength. The Rocket Race is a little bit narrow compared to standard saddles, but it makes up for it with some firm padding. The firm padding ensures maximum energy transfer and comfort for its riders. On the performance front, the WTB Rocket Race is above average thanks to its padding and stiff shell. The saddle shape offers great versatility in multiple terrains, and the only drawback is that you cannot move around much. The Planet Bike A.R.S. 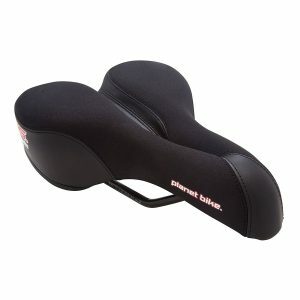 created from foam padding features a flexible base that increases the comfort and support of the mountain bike saddle. The A.R.S. has full-length center access and a cut out for comfortable anatomic relief. The A.R.S. 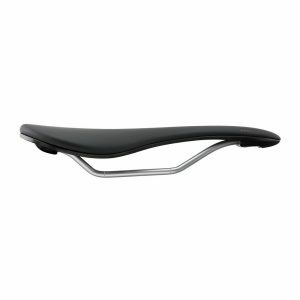 is built for long distance and rough terrains making it a very comfortable bicycle saddle for the rider. It has a sit-bone gel pad that gently cushions the cyclists’ pressure points. An additional full-length grove serves to distribute center pressure away from your susceptible areas. The ultra-soft padding on the A.R.S. helps in optimizing comfort while the steel rails offer more reinforcement. The Classic A.R.S. has a flexible base that provides a comfortable biking experience to mountain bike riders. The seat is extra durable thanks to the abrasion-resistant sides. 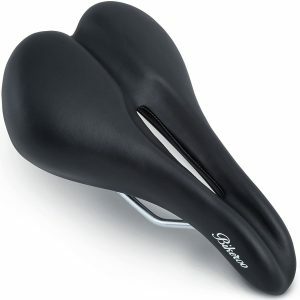 At 14.6 ounces, this bicycle saddle is a mid-weighted accessory that can make you enjoy your bike rides even more. The Bikeroo is constructed from good fabric and a leather base which manages to merge good padding and stiffness to improve comfort and efficiency. The common pains associated with mountain bikes will be a thing of the past with this bike seat. The central pressure relief channel installed helps with discomfort when riding for long hours. If you are a long distance rider, you will appreciate this supportive and comfortable mountain bike saddle. The bike saddle distributes pressure from your lower back eliminating any pain almost instantly. An uncomfortable bike seat can lead to back pain. However, one thing to note, the Bikeroo seat is uniquely crafted for men. The narrow design, soft padding, deep center ad ergonomic design helps relieve pressure from sensitive areas and allows you to paddle longer. 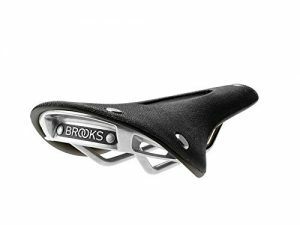 One of the premium bike seats in the market today, the rooks England C15 features the latest and the greatest technology in like seats. The C15 offers unparalleled comfort that is reserved for the professional and experienced cyclist. Coming in at below 3 pounds the C15 is extremely lightweight and ideal for long rides too. The C15’s mountain bike saddle is made out of vulcanized rubber and an organic top. The chassis is aluminum, and tubular steel rails give it even more durability. The firm design and ergonomic design is tailored to offer perennial relief to rider’s while riding. While the Brooks C15 is built for comfort, it also excels in performance as well. The firmness and suppleness reward the rider with professional level performance. Also, while sitting the long and narrow shape gives a soothing feeling. However, this durability and high-level comfort come at a price, but given the quality it is worth it. An increasingly popular choice for mountain bike saddles the fabric scoop elite saddle is an easy choice to make. The fabric scoop has a uniquely constructed comfortable seat that offers high-level performance. The seat comes in a variety of shapes and colors. The Fabric Scoop will allow you to choose between shallow, flat or radius shaped seats. In addition, the seats have a flexible nylon shell that offers one of the firmest seats we have seen in the market. Feature laden; the Fabric Scoop has a weather resistant micro cover coupled with Chromoly rails ensure that the seat can withstand any weather for longer. Looking at its versatility, the Scoop also holds up quite well as it’s built with a three-part saddle building process and a nylon base to give it additional flexibility. This mountain bike saddle is versatile enough to handle riders who move around, and the radius provides support to powerful less flexible riders as well. The radius is the largest seat and provides a variety of riding positions for long rides. In order to avoid saddle sore, you need a mountain bike saddle that fits perfectly. While the external skin of the mountain bike saddle is not considered as important for your comfort, it is something that should be considered for durability. Usually mountain bike saddle covers are either made of fabric, plastic or leather. Most manufacturers bore holes on the saddle covers in order to provide more friction. While the three should serve you just fine, always go for a cover that has simple features and sturdy corners. These prevent the cyclist from sliding off the seat while riding. It’s worth noting that leather catches dirt easily and plastic covers tend to be comfortable but very slippery. Always opt for a synthetic covering that is also hard. One part of the saddle that often overlooked is the chassis. The chassis is the part responsible for giving the saddle its shape. Commonly made out of plastic or carbon and makes the difference when it comes to the flexibility of the saddle. Saddles that have good flex are more comfortable. Good flexing helps in absorbing shock thereby negating the need for excessive padding on the actual saddle. Three materials often used by manufacturers to create the rails are steel, carbon, and titanium. These materials harbor different properties and are priced differently. Steel saddles are relatively heavier than the other two but are the cheapest option. Titanium rails are light and are more compliant when compared to steel. Carbon rails are as lightweight as titanium but have an extra flex for additional comfort. Looking at the length, a longer saddle brings an extra surface for the rider to shift about. These also allow the cyclist to maneuver his sitting position depending on whether he is climbing or going downhill. Shorter saddles are often observed with leisure riders and usually have more padding. Manufacturers have to ensure that the different seats they produce allow different preferences and sit bones. The saddle width usually comes in dimensions of 142 143, 155 millimeters and so on. Large retail brands will often have sit bone-measuring devices that can then be used to offer the best fitting saddle. If your retailer does not have that device, however, you will still have to pick a saddle. It is important therefore to note that too wide a saddle may cause restricted movements while one that is too narrow will mean insufficient support and discomfort. The shell is another major factor in a saddle shape. A well-designed cutout will relieve pressure in sensitive areas and offer good weight distribution. This decision is mostly based on personal preference with regards to the shell cut-out and the shape of your buttocks. The profile refers to the shape of the cross-section of the saddle. These range from super flat, shallow convex to rounded ones. Racing saddles are usually flat with very little padding and may sometimes have the middle section cut out. 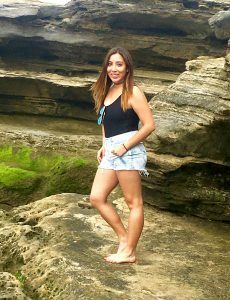 At the end of it all, you will need to sample out a number before finding a profile that suits you best. 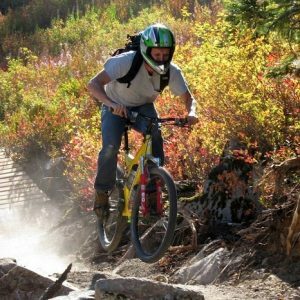 The padding on a mountain bike saddle is mostly associated with more comfort, but this is not always true. Increased padding may well also mean increased rubbing and chafing. The padding is usually designed to spread the weight of the cyclist over a large surface area. The most commonly used materials for the saddle padding are polyurethane and ethylene-vinyl acetate. These elements have a rubberlike feel, have high load bearing capabilities, are flexible, and have shock absorption capabilities. One thing to put at the back of your mind is that less is more when it comes to padding. 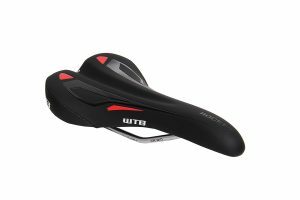 While there is the temptation to go for the saddle that is super plush, these can easily be deformed and ruin your cycling experience. The suitability of a mountain bike saddle will depend on its features as well as the preference of the buyer. In general, look for a seat that is durable, high quality and compatible with your riding style. Having a bad seat is not only uncomfortable, but experts have shown that it can lead to serious health issues as well. While there are many other mountain bike saddles, the five selected seats are the best and should serve you well. In addition, find a store that allows you to demo saddles, this is a good way to test the waters before taking the plunge.